A great turnout yesterday for Day One of The Fly Fishing Show-Pleasanton at the Alameda Fairgrounds. 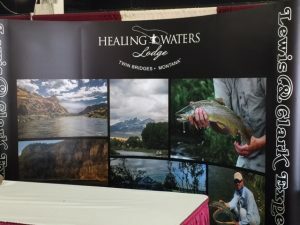 It’s Day Two and Mike Geary is in Booth F9, Healing Waters Lodge and Lewis & Clark Expeditions, talking about our lodge and guided fly fishing trips in southwest Montana, fishing the Beaverhead, Big Hole, Jefferson, Madison and Ruby rivers, plus, we have miles of private water access. Mike also owns Lewis & Clark Expeditions and is the largest outfitter on Montana’s Smith River. He can answer your questions about our 5-day/4-night float trips down the coveted Smith River. April 14-19 and April 23-28, we offer fly fishing school vacation packages (space available) while staying at Healing Waters Lodge, and we book day trips all season long. Contact Mike at 406-459-2030 for details.